This is a very special little fellow! He was made by Michael Hunter for Twists Glass in 2012 and is a one off. His back, sides and the top of his head are made of zanfirico canes being mustard and white alternating with black and white. He has large latticino eyes with a murrine cane centre, a yellow cane beak and his breast is made of turquoise and purple murrine canes randomly interspersed with white murrine canes. He is hollow blown and is scratch signed "M Hunter Twists 12" and has a Twists Glass studio label. 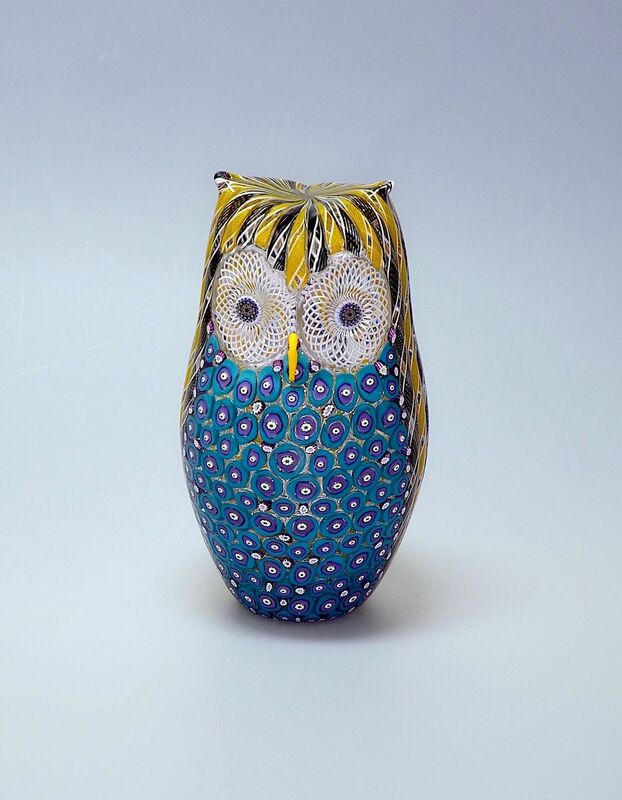 This owl has been in Mike & Sue's personal collection since he was made. Sue told us about him quite a while ago and it has taken this long for us to persuade them to set him free! It was worth the wait!